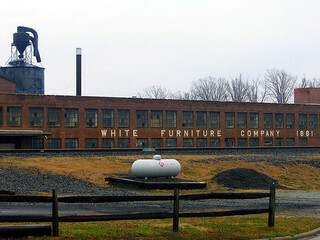 The White Furniture Company was organized in Mebane in 1881 by brothers William E. and David A. White, sons of Mebane cofounder Stephen A. White. The factory was incorporated as the White-Rickel Furniture Company on 9 May 1896. There were three principal incorporators, including A. J. Rickel from Manchester, Ohio, who moved to the area looking to invest in the furniture industry. By 1899 he had sold his interest in the Mebane plant, and thereafter the firm was known as the White Furniture Company. In addition to manufacturing window materials, the White brothers contracted for building jobs. The mass production of building materials eventually led to the standardization of architectural forms throughout the state. The White Furniture Company's success in this lucrative industry led to the production of fine furniture in 1896. Specializing in furnishings for bedrooms and dining rooms, the company continued to prosper. Always on the cutting edge of technology, White Furniture became one of the first plants in the South to utilize electrically powered machinery. In 1905 the company became the first southern furniture manufacturer to be awarded a contract with the U.S. government, supplying furniture to military personnel working on the Panama Canal. Eventually the company supplied solid mahogany furniture for the quarters of army officers throughout the United States and the Far East. In 1912 White Furniture provided the furnishings for Asheville's famed Grove Park Inn, many of which are still in use. During the Jamestown Exposition of 1907, White Furniture received an award as the top manufacturer of furniture in the country and a blue ribbon for best furniture display. Eventually the company became known for its elegant mahogany dining room furnishings. The pieces produced by White Furniture featured classical designs with attention given to details, such as the selection of fine, kiln-dried woods. Carefully crafted inlays became the company's trademark. In 1940 White Furniture expanded its business and opened a factory in Hillsborough. During World War II, the company again received government contracts. In 1982, the factory building itself was placed on the National Register of Historic Places. In 1985 the Hickory White Furniture Company, which had no connection to the Mebane firm, purchased White Furniture, ending family ownership after 104 years. Subsequently, in 1993, Hickory White downsized its operation, closing the Mebane plant and consolidating all of its activities in Hickory. Bill Bamberger and Cathy N. Davidson, Closing: The Life and Death of an American Factory (1998). Cherry, Robert Gregg. "Industrial Safety: Address Delivered on the Occasion of Presenting Certificates of Achievement in the Field of Industrial Safety to the Orange Furniture Craftsmen, Hilllsboro, December 17, 1946" Public addresses and papers of Robert Gregg Cherry: Governor of North Carolina, 1945-1949. Raleigh [N.C.]: Council of State, State of North Carolina,1951. 578. http://digital.ncdcr.gov/cdm/ref/collection/p249901coll22/id/421801 (accessed March 8, 2013). White Furniture Company. Image courtesy of Flickr user Lance McCord. Available from http://www.flickr.com/photos/mccord/7524540/ (accessed June 26, 2012). I have a White Furniture Co mahogony anniversary chest in perfect condition with a descriptive manual and Bill of Sale...Have you any idea what it may be worth ?? Thanks for visiting NCpedia and taking a minute to post your question. Unfortunately, NCpedia is an online encyclopedia and we don't have any information to help with appraisal or furniture identification questions. You may want to consider contacting an antique dealer. Thanks for visiting NCpedia and sharing your comment. Unfortunately, NCpedia is unable to help with this question. The NCpedia is an online encyclopedia of North Carolina information. That is probably a reasonable assumption that the number is the model number, but you may want to try searching the internet or contacting a furniture or antique dealer. Hi! I just picked up a beautiful White Furniture "Promethean Collection" china top and buffet. I'm considering refinishing it, but I'm trying to figure out if it is solid wood, or veneer, or a combination of both. Is there any information you can provide, or can you point me in the right direction? I have a White Furniture Co. I saw a picture of an old postcard for the Continental Chair Company and it sure looks like the White Furniture complex. We're these two companies related?